Teacher Adrian Coltman was so appalled by speeding traffic on a north Leeds road that he drew up a safety plan for the city council. 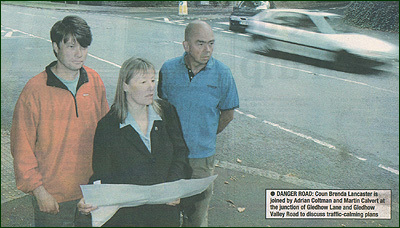 Highways officers were so impressed by his ideas that they used them as the basis for a £165,000 traffic-calming scheme on Gledhow Valley Road. Safety measures will now be introduced before the end of this year in a bid to reduce the damage. In the last five years there have been 114 accidents along this road, 14 of them serious. Speed and problems at junctions have been the major causes, and drivers have been seen doing 70mph in the 40mph limit. Now the speed limit is to be cut to 30mph, speed tables will be introduced at junctions to help pedestrians cross safely, and lighting will be improved. Trees, which have grown significantly this summer, will be pruned back so they do not obstruct street lights. Mr Coltman, 41, of Gledhow Park Crescent, said: "I was walking my children to school one day and literally couldn't cross Gledhow Valley Road. I was amazed at the speed of the traffic and the way motorists were overtaking each other." "So I put a few ideas down on paper after looking at schemes which had worked elsewhere in the country." Mr Coltman and the Friends of Gledhow Valley Woods lobbied city councillors to take action, and councillor Brenda Lancaster (Lib Dem, Moortown) convened meetings with highway officers. She said: "I was very impressed with Adrian's ideas and we put them on display at the fun day in Gledhow Valley Woods. Members of the public then contributed their views." "We are delighted we have got what we wanted, and I'm sure the public will tell us if the measures don't work. They will only add a minute or two to journeys, and drivers might find the time so see what an attractive road this is." Martin Calvert, chairman of the Friends of Gledhow Valley Woods, said: "I won't let my children go to school on their own because it is dangerous to cross the road. In August last year there was a crash every week." Councillor Gerry Harper, executive board member responsible for highways, said: "This is a major package of improvements to tackle the problem of speeding, and I am sure they will be welcomed by residents." If you would like to know more about how the Friends of Gledhow Valley Woods are trying to help make the roads safer, please see the Traffic Calming & Pedestrian Safety page in the Examples of How the Friends are Making a Difference section.